Published June 28, 2018 at 3:16 a.m.
Huey Lewis and the News in 1984. George Carlin in 1972. Sly and the Family Stone in 1970. There are certain legendary Summerfest shows whose infamy has lived on long after the crew cleaned up the stage. And, thanks to its Big Gig-breaking Miller Lite Oasis show in 2013, a bottlenecked mania at the gates that ended with thousands of fans blitzing into the grounds for free, Imagine Dragons sits forever alongside those icons. On Wednesday evening, the top-40 rockers made their return to the scene of the craze – this time at the bigger and much more befitting American Family Insurance Amphitheater – in the unenviable position of having to provide an encore to one of the most legendary nights Summerfest has seen this side of the millennium. Unsurprisingly, the resulting show couldn't compete with its past performance (save for personal space; definitely had it beat there). But a little less than legendary was still more than enough to satisfy the sold-out crowd – and a more than satisfactory start to Summerfest. A bigger venue still meant a suitably bigger show for the Las Vegas-based band, introduced by some very epic orchestral music before the giant screens above the stage booted up and four drummers rose from a platform, pounding away an intro to "Radioactive," a set opener so rollicking lead singer Dan Reynolds' piano bench and mic stand didn't survive the song upright. From there, the hits kept coming with the band's breakout hits, "It's Time" and "Whatever It Takes," off its most recent album, "Evolve." In between the numbers, Reynolds preached to the packed Amp crowd about celebrating life, the main theme echoing through the night. The band's never been afraid of theatrics – even leaving out its signature anthemic rock sound. This is the same group that came out for its BMO Harris Bradley Center show years ago from behind a giant white curtain, massive shadows teasing their arrival. That concert, however, also made much more time for casual conversation, for goofing around between band members and light jokes with the audience. There were bright sparks of lightning to go with the booming thunder. The moody import dragged the show every time it built momentum, the next song shifting down and having to slowly grind back up to speed. Even the charismatic Reynolds occasionally struggled with the ponderousness and – I hate to bust out the p-word – pretentiousness. The preaching about being "boxed" before "The River" and how we never know when life will end to tease "It's Time" came off stiff. (In the case of the latter, he seemed to know that, clarifying, "It's not morbid, just true.") Even some of his on-stage movement felt more like grand rock posing, posturing rather than performance, maybe straitjacketed by the set's seriousness or sometimes stilted pace. Either way, the spark plug from past shows I remember felt just a touch more scripted. When Reynolds loosened into his comfort zone on stage, however, the performance came alive. He really sells his lyrics while he's singing them, emoting the heck out of the likes of "Whatever It Takes" and thoughtfully lingering on "I'm never changing who I am" from "It's Time" (perhaps more meaningful coming in the afterglow of his recent HBO documentary "Believer," about his work with empowering LGBTQ people, despite his strict Mormon faith upbringing). When he speaks more casually and earnestly from the heart – talking about the band's first visit to The Rave or making a moving and timely cry for seeking help, understanding and acceptance about depression and anxiety – the concert found the life it promoted. For all the show's inclinations toward theatrics and statements, the unforced natural moments shined much more brightly. Even just reaching out into the crowd for a tender hand touch at the opening of the show carried more feeling than a late video montage about the Great Depression and the New Deal to intro "Demons." In fact, the night's most enjoyably theatrical moment may have been a brilliant accident: a firework-related lyric on "Rise Up" punctuated perfectly by the start of the Big Bang. And then there's just the pure musical joy and childlike satisfaction of bashing away at the beat with a big ol' drum. That's the thing: Even when the show plodded a bit finding its rhythm, the triumphantly bombastic songs always picked things back up, played and mixed perfectly. Even during the middle section, the songs themselves were stars, like the "Africa"-esque groove of "Start Over," or the rocking guitar and drum solos of "I'll Make It Up to You" and "I Don't Know Why." Eventually, in the final third, the concert fully found its rhythm – ironically around the time the band left the stage. 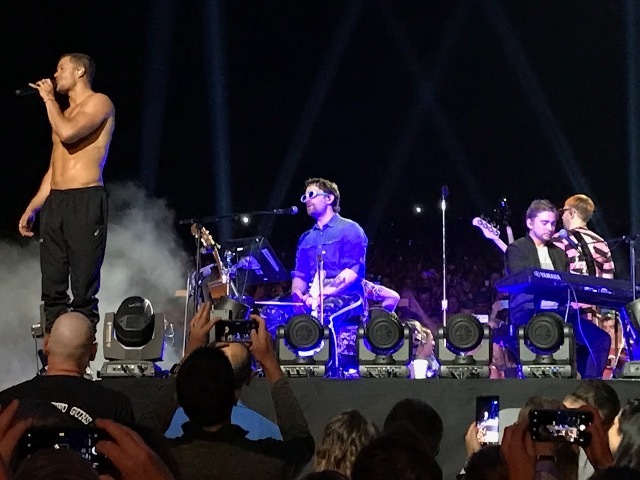 After going out into the crowd and playing in the round, gathered on a small, makeshift stage on the main concourse to play some toned-down renditions of "Born to Be Yours," "Amsterdam" and "I Bet My Life," honed into an almost country-tinged acoustic version, Imagine Dragons stuck the landing, powering through some of its biggest hits like "Thunder," "the chipper "On Top of the World" – complete with a downpour of giant balloons – and "Believer" as the final number (or world's fastest encore). At this point, not even a brief mic snafu requiring a speedy on-stage visit from a crew member during the penultimate song could slow the show's roll. At the end, Imagine Dragons may not have outdone its past performance – a less tight crowd, sure, but traded this time for a slightly less loose band. But I'm sure fans (and, judging by the packed Amp, Summerfest) are already eager to bring them back as soon as possible to try again. Speaking of people to bring back, Grace VanderWaal was an unexpected surprise as the opener. Texture and personality aren't attributes one expects from a voice found on a reality TV show ("America's Got Talent," in her case), but that's exactly what VanderWaal's soulful, raspy tone has. It's just not fair for a teenager to have a voice already that interesting. It seems like maybe she's still finding her exact sound, trying to meld her ukulele singer-songwriter origins with more radio-friendly pop-rock, but considering she's only 14 years old, I'd say she'd got plenty of time to figure it out. "I'll Make It Up to You"